A few days ago I posted some details on a new digital library launched in a subway station in the capital of Romania. That project wasn't so much a digital library as it was a marketing ploy by Vodaphone and several local publishers which offered a paltry selection of sample ebooks. That project wasn't nearly as impressive as a similar one which the city government of Mexico D.F. launched back in September. 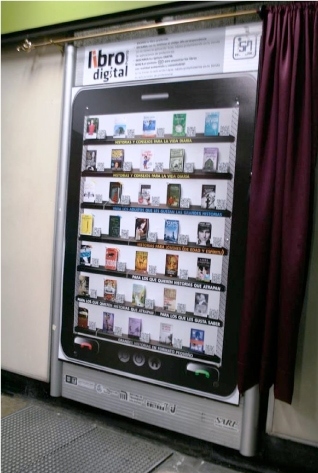 The Libropuertos Digitales project makes ebooks available on all 21 stations of the 3rd line of the Mexico DF Metro. Commuters will find signs like the one at right in a couple locations at each station. Each sign shows 35 book covers as well as QR codes which can be scanned to download the ebooks. The titles displayed vary from sign to sign, and the signs will be updated periodically to offer a changing selection of content. The initial selection will include books from writers such as Carlos Fuentes, Mario Vargas Llosa, Julio Cortázar, José Saramago, Mario Benedetti, Fernando Vallejo, and Xavier Velasco, among others. This, too, is more of a marketing project than a library, which would make some sense give that the project title translates (roughly) as The eBook Portal. Readers can download sample chapters as well as book trailers and other info about the ebooks. There are plans to also include augmented reality videos. The Libropuertos Digitales project is also going to be making use of the space set aside for an earlier project which had the same goal. The Ticket to Read program involved reading lounges at a couple stations on the 3rd Line which offered material for commuters to enjoy while they waited. That program also distributed printed anthologies which readers were supposed to bring back and trade for different editions. The goal of this project is to encourage reading both on commonly available tech like smartphones as well as simply build interest in reading in general. Later this year the project is going to expand to other Metro lines. Has anyone tried the new program? What about the older one?